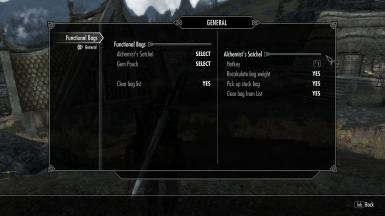 Add various functional bags, pouches, and other special containers. Functional Bags contains no meshes or texture derived from Dragten's work, it only uses them with the author's permission. Add various functional bags and pouches (using Dragten meshes and textures) and other special containers. The bags can be opened, used to auto-sort and simplify your main inventory. They reduce the weight of items within by 20% (40% when the bag is worn) and finally, certain bags can be worn on the right side or swapped to the left side on the spot. The bag interaction menu can be hotkey-ed for convenience. This is not meant to be a complete and exhaustive inventory replacement or bag solution. This is an experiment to see what is possible. I'm rather hoping that someone will pick that up and extend it to all sort of bags and items that match their function. Again, just something I made for myself as an experiment but since it worked so well I thought I'd share. Shinji72 graciously made this video showing some of the bags and the main features in action. Bags store only certain types of items. 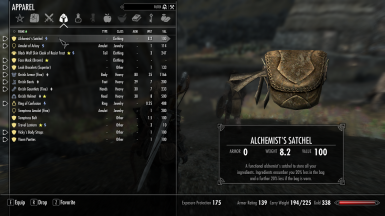 For example, Alchemist Satchel can only store ingredients, Hunter's bag can only store animal parts and pelts, etc. Bags can be loaded automatically, thereby cleaning your inventory. Some bags can be worn on either side. Bags can be hotkey-ed for quick access. Weight of bag is the base weight plus the weight of its content. Item inside weight 20% less and a further 20% less if the bag is worn on the player character. All items are craftable of course. Bandolier - Bags and Pouches Needs to be installed, but not necessarily activated. Functional Bags contains no meshes or texture derived from Dragten's work, it only uses them with the author's permission. Only one bag of a kind should be in the player's inventory because they will all weight the same. This is a limitation of Skyrim's engine. There is, however, no bug if you were to do so and no advantage whatsoever in doing so. Bags revert to their default side on when the game is reloaded from desktop. Again, not a big deal. These bags shouldn't be crafted willy-nilly because they link to a permanent chest. What it means is that it's perfectly safe to craft as much as you NEED, not level up smithing with it. Bethesda for creating Skyrim and the Elder Scrolls series. 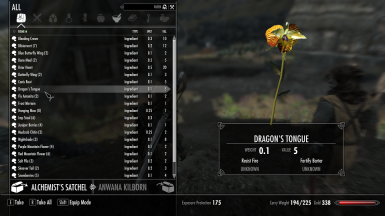 Dragten for his nice Bandolier meshes and textures without which this mod wouldn't look as good.